Take me to Paris My Love. 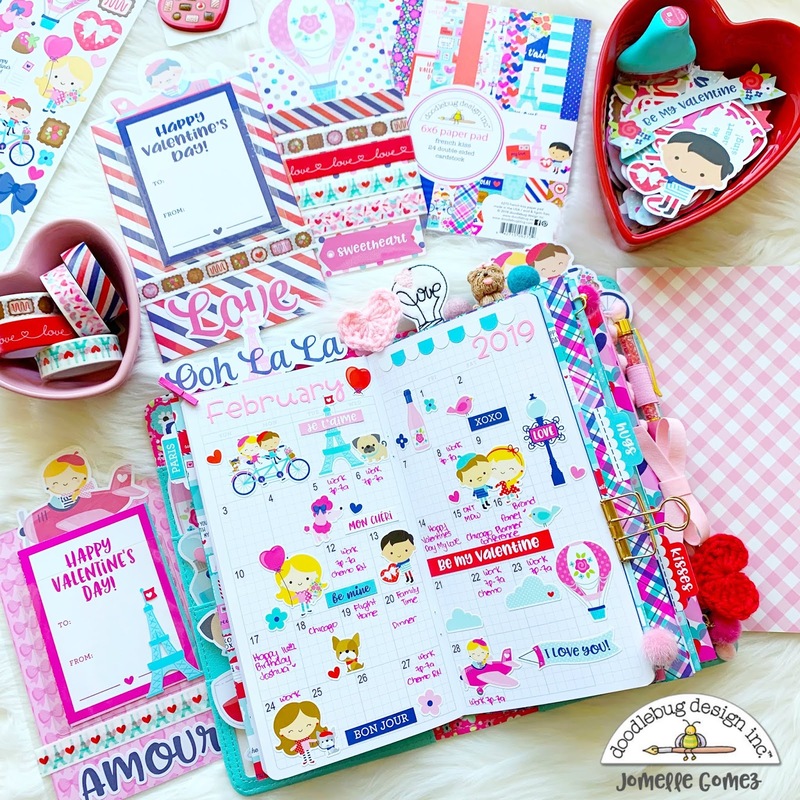 The French Kiss collection has many beautiful pieces and elements that makes me want to go to Paris for Valentine's Day. 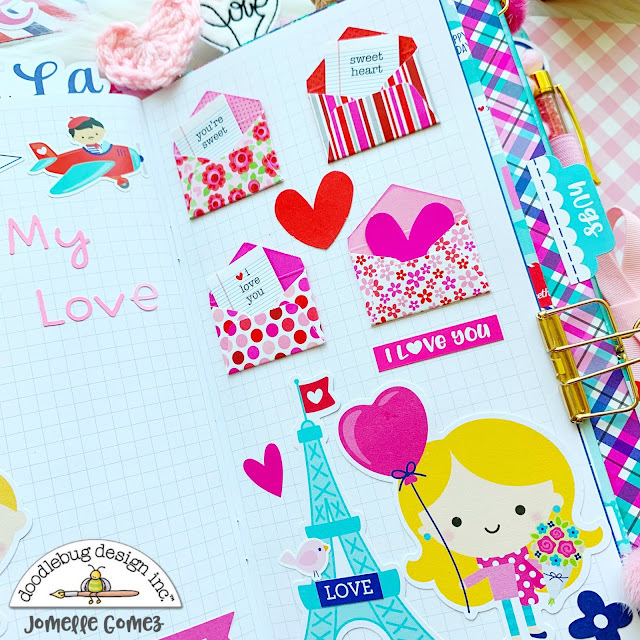 Creating layouts and spreads in my Poppy Dot Daily Doodles Travel Planner will just have to do for now. I really wanted to add a heart shape insert but didn't know exactly what to do or what I want. 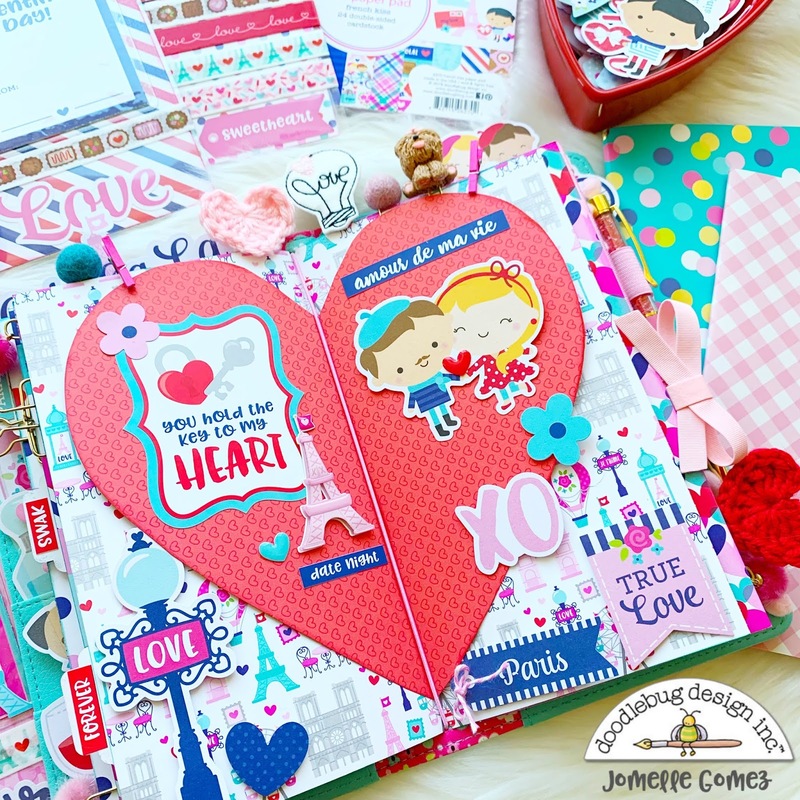 I just started by cutting a big heart shape using the "bonbons" cardstock paper. I know I wanted the color of the heart in red. Once I have the heart cut up, I folded it in half and placed it in the middle of one of the cover insert I created previously. I then started to decorate it with stickers and odds & ends. Valentine's Day is on February 14. 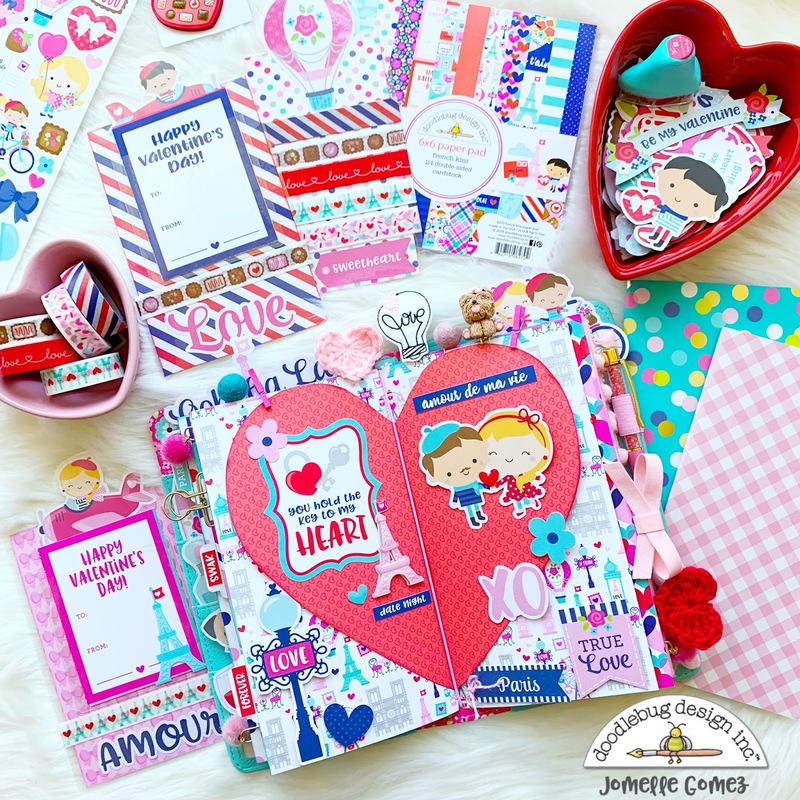 This collection is perfect to create my Heart Day theme monthly layout. 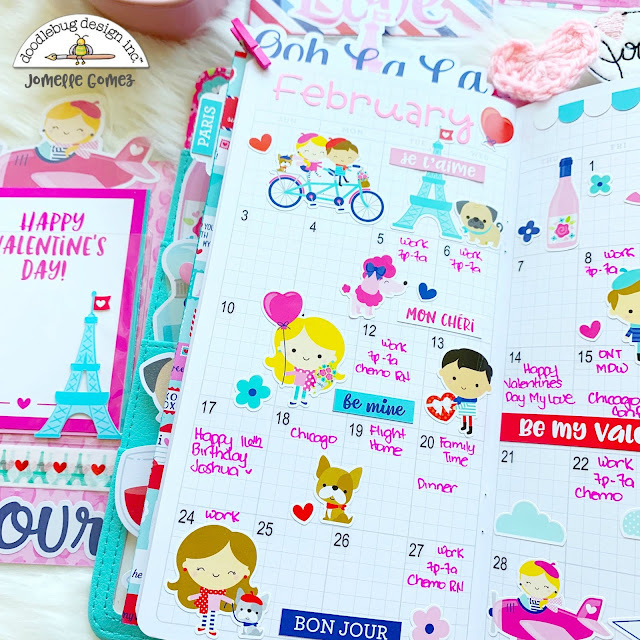 I pre-decorated the pages after the monthly layout. I haven't decided what to do with this page. Maybe I can add a picture of me and hubby when we do go on a date this Valentine's Day or I can write him a love letter. Maybe I can do both. What do you think? 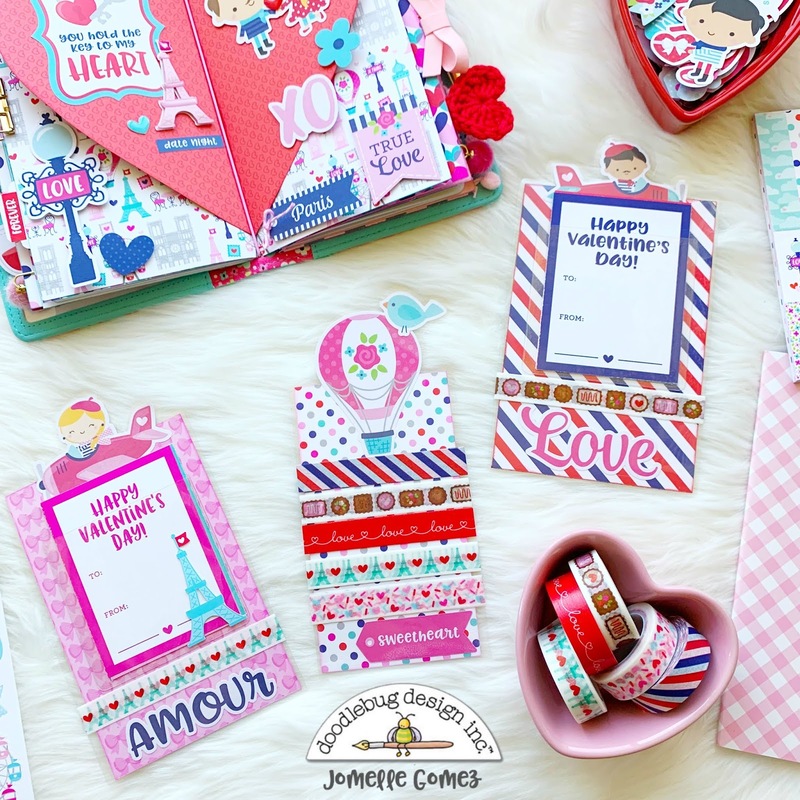 How cute are these mini love notes? They are perfect to use since they are flat and not too bulky inside your insert. 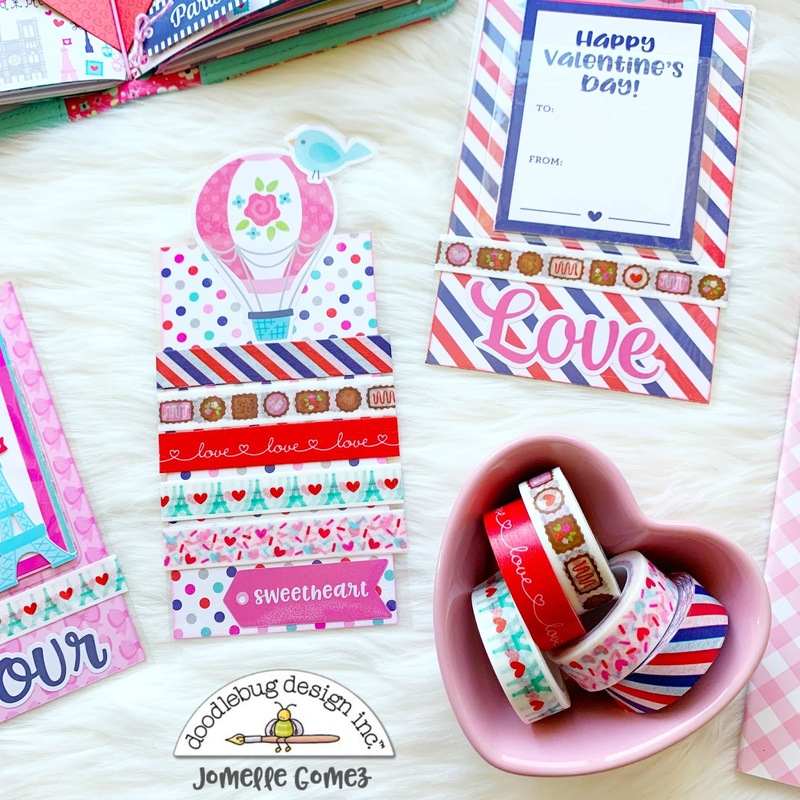 I've been having fun creating these laminated page markers and washi tapes holder. 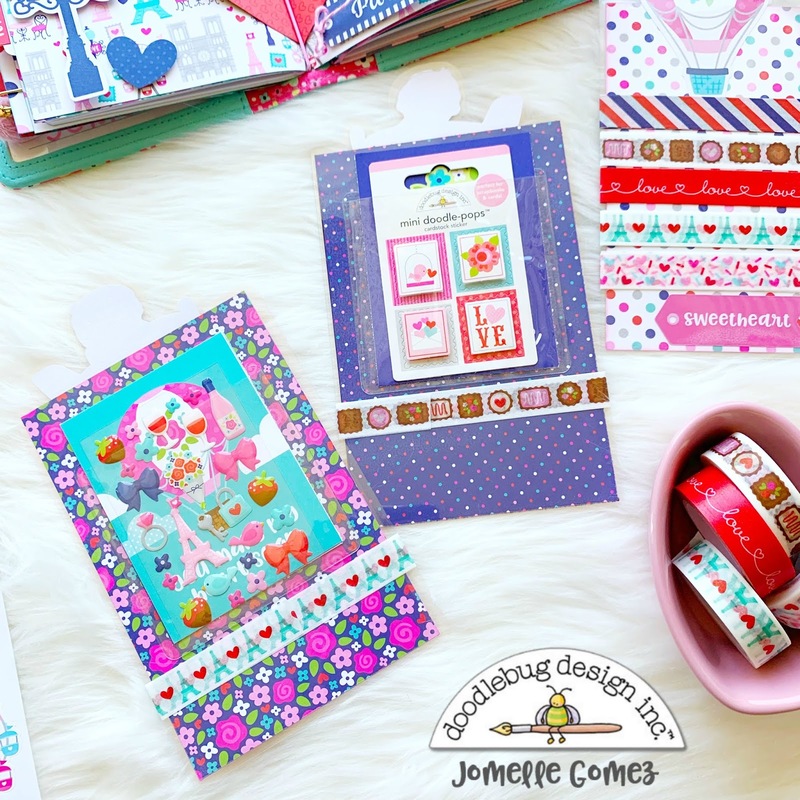 These page markers/washi tapes holder are super easy to make. 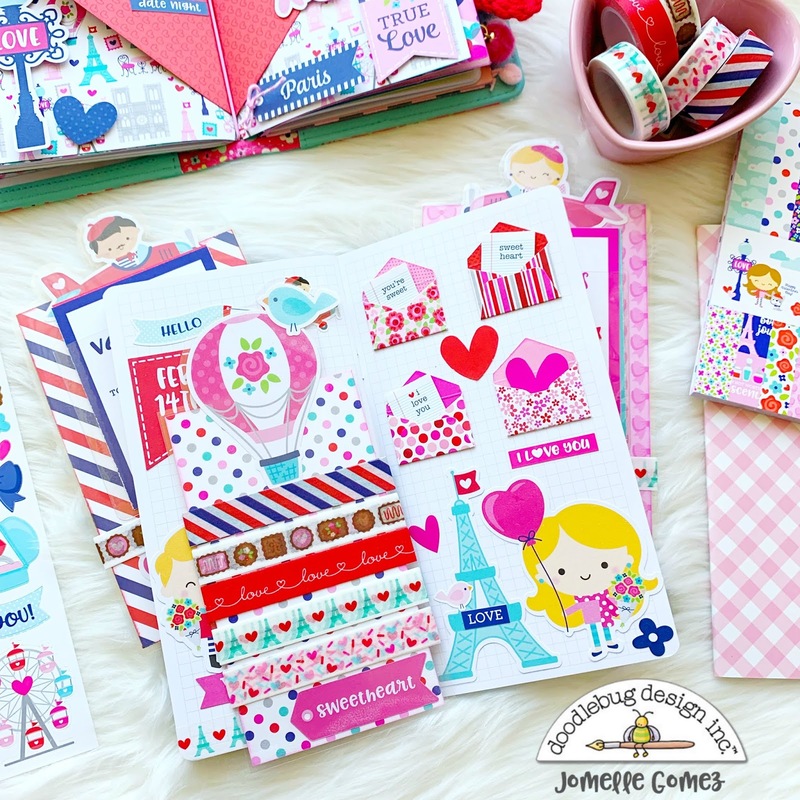 First, I choose the patterns/designs of the cardstocks I want to use. Then I cut them to the size I want or need. I then add couple of odds & ends, one larger piece to the top and another on the bottom of the page. I place the larger odds & ends piece slightly sticking up on the top. Then I laminate and cut. Super easy and fun to do right? You can also see the washi tapes I used to wrap around one of the page markers so I can carry them with me and not bring the whole roll. As I've mentioned in my past blogs, I added the clear adhesive pockets from Target Dollar spot to hold those pretty elements. I love using the adhesive pockets. You can see here how I place my page marker inside my insert. Of course I'll have the hot air balloon slightly sticking up to the top when I close the page. I also added a clear adhesive pocket to the back side to hold more embellishments to take with me on the go. I will go and visit Paris with my husband someday, hopefully soon. 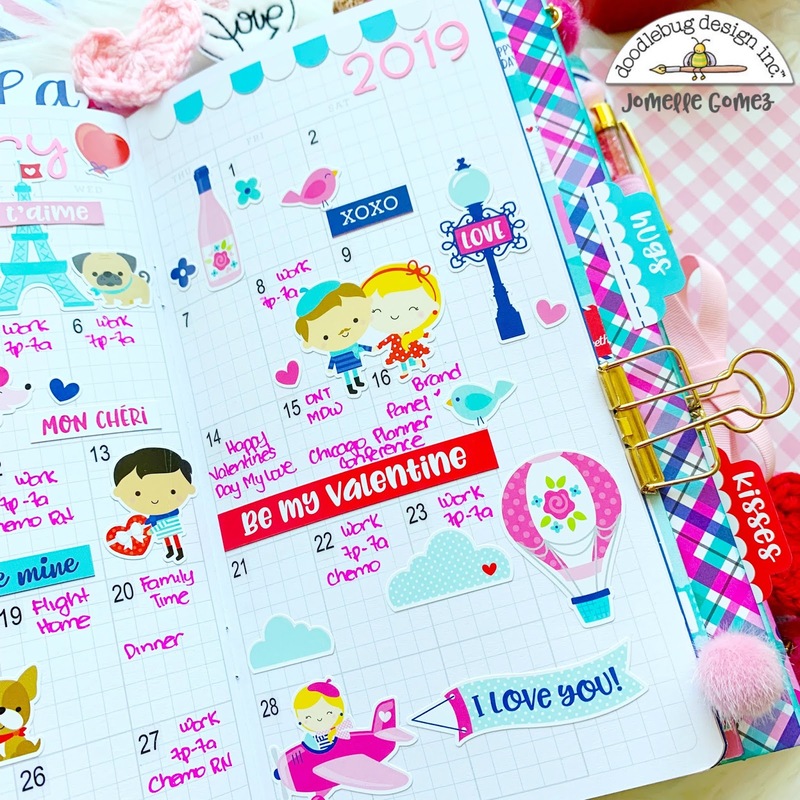 Thank you for stopping by and I hope I was able to inspire you to create a Heart Day theme set up in your Daily Doodles. My fave part of this collection are the adorable characters, and you've used them beautifully on your pages. Thanks for sharing this inspiration with these fun products. I live those washi tape holders!! And your heart spread is fabulous! Did you get the Target clear adhesive pockets recently? I could not find then when I went today.